Omnigrid brings easy to see, even easier to cut rulers to you with the Omnigrip ruler. Special nonslip backing eliminates slipping when measuring and rotary cutting. 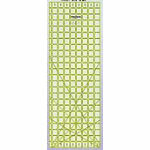 Neon green doublesight lines that seem to glow on fabric make measuring accurately a breeze 8.5 X 24 in.